Global warming? I think not. It is snowing in Central Texas again, with March just right around the corner. Snow day, anyone? 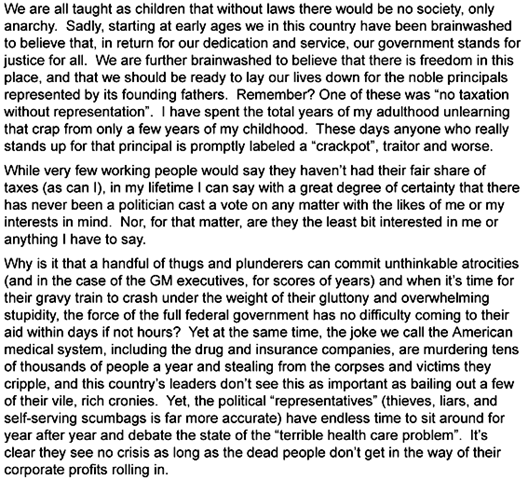 What made Joe Stack, 53, a computer programmer with a history of trouble with the Internal Revenue Service, write a lengthy diatribe blasting the government in general and the IRS in particular, then deliberately take to the air and crash his private plane into an office building housing the IRS’ “office of last resort”, killing himself and another person believed to be an IRS employee? To an observer such as myself, Stack’s actions don’t make a lot of sense. Whatever the man’s beef with the feds – and there are many legitimate reasons to have one – going out kamikaze-style, while vivid imagery, can have only one ending for the pilot, a painful death. Further consider that the U.S. government, while having grown far beyond its Constitutional authority, is still relatively benign by comparison to other nations, even western ones. Why then does it so enrage a fringe element of society such individuals come to believe that homicidal attacks of revenge are their only recourse against it? Obviously Stack either didn’t take the time to sew the threads of his logic tightly together or he wasn’t fully capable of it. Nevertheless, he raises points that have been discussed in many homes and office buildings around this country of ours since the house of cards Wall Street built began to crumble a couple of years back. 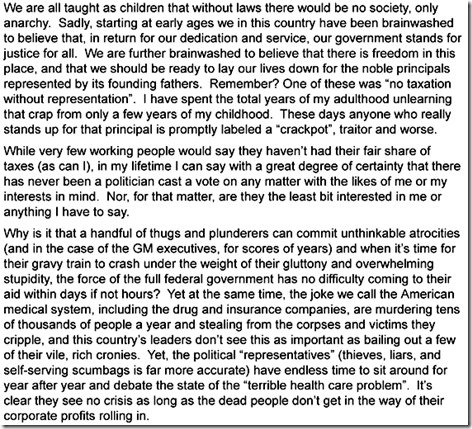 What enrages arguably deranged individuals like Stack and ordinary Americans like myself and many others, including the much-maligned Tea Party crowd, is relative injustice of life as a working citizen of this country. In absolute terms, Americans live the easiest and most enjoyable lives of any people on the planet. Opportunity abounds here and the vast majority of us live comfortable lives in which the most oppression we have to deal with is an overbearing superior on the job. Compared to those living in Ethiopia or Sudan or even relatively civilized countries like Egypt or Turkey, we have virtually nothing to complain about. Yet we perceive injustice because the federal government has grown in the last century from an entity that was unable to levy a national income tax to one that seems to find it both necessary and desirable to expand its influence into virtually every aspect of private life, including the recent trend toward spying on Americans’ private communications and controlling our medical insurance programs. As any student of psychology knows, the actuality of a person’s situation is not so important as his/her perception of that situation. Thus Joe Stack. In truth, government is out of control in this country. Barack Obama’s brief reign in the presidency is the textbook example of what the Founding Fathers of this country were guarding against: a wasteful, bullying, confiscatorial federal government that does exactly what 51% of Congress wants it to do with no regard for the consequences their inept economic and social programs will have on future generations. The question is not whether Stack had just cause to rebel but whether more will follow in his footsteps. I think not in great numbers. Despite the ruinous fiscal policies of the last 2 administrations, it is still possible for a hard-working American to do well and create a prosperous life for his/her family. So long as that’s true the government can rest easy that the masses will take their revolt little farther than the ballot box. Whether we acknowledge it or not, there’s a Joe Stack lurking inside many Americans and the powers-that-be should beware lest he come out in full force against them, destroying the rest of us in the process. Let’s pray that our leaders recognize, however, the finite and fast-approaching limits to their power. More than that, let’s take our beef with the feds precisely to where the battle should be joined – at the aforementioned ballot box. Vote the current crop of tax-a-lot-and-spend-more-than-that Congressmen out of office. Elect new representatives who will cut spending, eliminate the wasteful bureaucracy, balance the budget, and reduce the deficit. It’s our choice and our right to control what the people we send to Washington do. Exercise that right and there won’t be any more Joe Stacks. Fail to do so and he’ll be back with a vengeance. "Oh, I am. Absolutely," he told ABC’s George Stephanopoulos today. "Who’s not sorrowful for the entire chapter in American history." It may surprise readers of this column that I think Starr should regret both his participation in the persecution of Clinton and the degree to which he carried out his orders. "The law is the law.” Says Starr. But applying the law without the filter or restraint of common sense is a sure-fire way to create injustice, as in the Clinton perjury case. Perhaps it is unfair to criticize Starr for his role in the affair, pun intended. After all, he was not the one who sprung “the question” on Clinton while the president was on trial for allegedly sexually harassing Paula Jones. And perhaps Mr. Clinton deserved the fines and the legal smack in the chops he received for other activities for which he was not on trial. Nevertheless, Ken Starr could have examined the matter he was charged to prosecute, found it frivolous – which the Monica Lewinski scandal certainly was – and refused to participate in the Republican-led dog pile that all but ended the Clinton administration. But he didn’t. We’ll never know what might have happened if Starr had acted thus. Left alone, Clinton might have been able to govern the country effectively during his last 2 years in office. Perhaps he would have pursued known terrorist Osama bin Laden more aggressively, a real possibility given that the 9/11 mastermind was in the CIA sights on more than one occasion during Clinton’s presidency. Or perhaps not. We’ll never know for sure. But one thing is certain: There is little more Starr and the Republicans in Congress could have done to create a vacuum in presidential leadership between 1998 and 2000 than they did and that’s a travesty given the insignificance of the matter over which Bill Clinton was charged.